I’ve had so many questions about why Facebook is important in the past few months. Even those who hate social media are tentatively asking me whether I would explain a few things. And those who have grown up with Facebook don’t necessarily understand what it can do for your blog, business, charity or hobby. While some platforms have come and gone, Facebook powers on. One in five visits to the Internet worldwide is to Facebook. If you write a blog, run a small business or help out a charity, understanding Facebook is a huge part of getting your message across. The Middlesized Garden blog is mainly for amateur gardeners whose gardens are larger than a courtyard but smaller than an acre. When you first type www.facebook.com and sign up, you will sign up as a person. For example, Alexandra Campbell. This is your personal Facebook Profile. You can add a photo of yourself, say where you went to school, when your birthday is, and so on. It’s up to you as to how much to reveal. You can set privacy controls and decide who sees what. However, Facebook rules dictate that anything remotely ‘professional’ should be run from a Facebook Page. Recipes and b&b accommodation on the Kelly Mill Facebook Page – it has a friendly, personal feel, but this is still a Facebook Page, not a personal profile. Which is how it should be. I should not, for example, be putting the Middlesized Garden blog posts on my Personal Profile. You should not be ‘advertising’ your business on your Facebook Personal Profile. Those are Facebook rules. You will be put on the Naughty Step and have your Facebook presence disabled when/if they find out. Although when you look at some people’s personal profiles, you will see this rule is often broken. At your own risk! You can only have one personal Profile. This is necessary in order to run a Facebook Page. But you can have lots of Facebook Pages. For example, from my personal profile, Alexandra Campbell, I run four Facebook Pages. They are The Middlesized Garden (for the blog), Faversham Open Gardens & Garden Market Day (obvious) and two others for clients. If you run a Facebook page, you’re called an Admin. You can have more than one Admin running a Facebook Page, so I’m not the only one (phew!) on any of them. Facebook will ask you to say which category your business or hobby is in. It doesn’t offer ‘blogger’ so I chose Brand or Product, then a sub-category of Home & Garden. You must have a photo. There are two places for photos at the top of the Page. It looks weird if you leave either blank. They should be photos that help explain the Page. The Middlesized Garden Facebook Page has a photo of me, plus a ‘gardening’ photo. A friend recently asked for some help with her Facebook page. She runs cookery holidays, so she had a lovely close-up photo of tomatoes as the main photo on her Page. But that doesn’t say ‘cookery holiday’. It could be veg growing or healthy eating. We are so lucky in the world of gardening. Lots of heavenly photos out there. It’s a bit more difficult if you’re selling widgets. Then the name of your Facebook Page needs to match the name of your blog, company and other social media names exactly. Well-known gardening and TV personality, Michael Perry, for example, used to be ‘Gardening Greek’ on Twitter. Now his Facebook Page, website, Twitter and Instagram are all Mr Plant Geek, with the Michael Perry name also very visible. It’s easy to find him, and also to understand what he does. 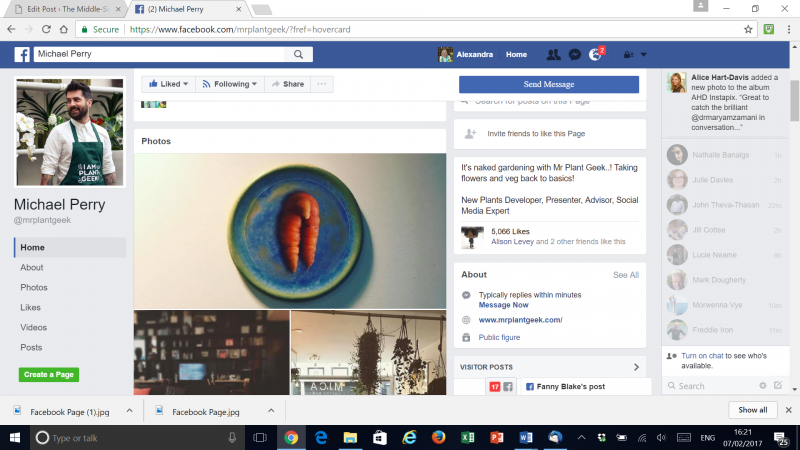 Mr Plant Geek’s Facebook Page is a bit different – check out the wicked vegetables (above). You need to fill in the ‘About’, preferably without being too bafflingly self-deprecating about it. People just want to know what you do. Really. Add your website/blog link, too, everywhere that Facebook suggests it. Now you need to know about the Facebook algorithm. The word ‘algorithm’ has most people fidgeting in their seats, but hang on in there. Now Facebook knows whether you’re really interested. If you politely click ‘Like’ on a friend’s Garden Widget Company Facebook Page, but you’re not interested in Garden Widgets, Facebook will know. Spooky, isn’t it? You will never see a post from the Garden Widget Company because it will be too far down the algorithm. On the other hand, if you really are interested in the Middlesized Garden (pretty please! ), then you will see (some) Middlesized Garden Facebook posts. If the Garden Widget Company wants to get their posts seen by more people, it must pay. You can either pay to boost specific posts up the algorithm. Or you can pay to invite more people to Like your Page itself. It’s cheap – you can start boosting your posts or your Page for less than £5/$5. And it’s highly targeted. The Garden Widget Company can specify male/female, age range, geographical range and ‘interests’ when setting up the boost. It can specify that the Facebook post – or Page – be shown to men between the ages of 35 and 50, living within 50 miles of London, who are interested in garden widgets. How you ‘boost’ your posts by paying any amount you choose. You can also choose your audience and their interests. Facebook can often reach thousands of people who match the description. That’s how Facebook makes its money. However, it’s now much more difficult to get what is called ‘organic’ growth on Facebook. Organic growth means getting people to like, follow and share your posts without your having to pay. 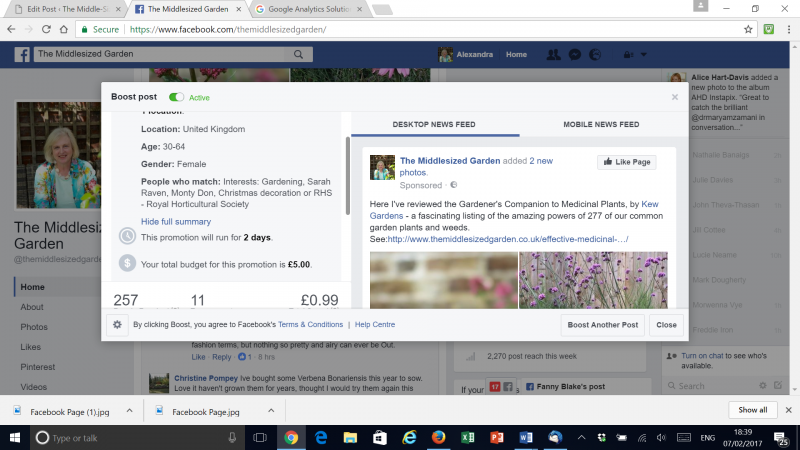 I didn’t intend to pay more than £5 to promote the Middlesized Garden Facebook Page. I was just trying everything out to help understand why Facebook is important and how it worked. But I accidentally ticked the wrong box, so the promotion kept running until I’d spent £120. Gaah! It’s lucky Mr Middlesize doesn’t read this blog…. It did mean I got about 1,500 Likes in around four months, all interested in gardening. On Twitter or Instagram, paying for followers is pointless as they may be herdsmen on yaks in Outer Mongolia. Or even fake accounts. On Facebook, you can be very specific as to who is invited to ‘Like’ your Page. I specify people who are interested in gardening, the NGS, Sarah Raven, the National Trust etc. Facebook will only invite real people who are interested in these things to ‘Like’ my Page. 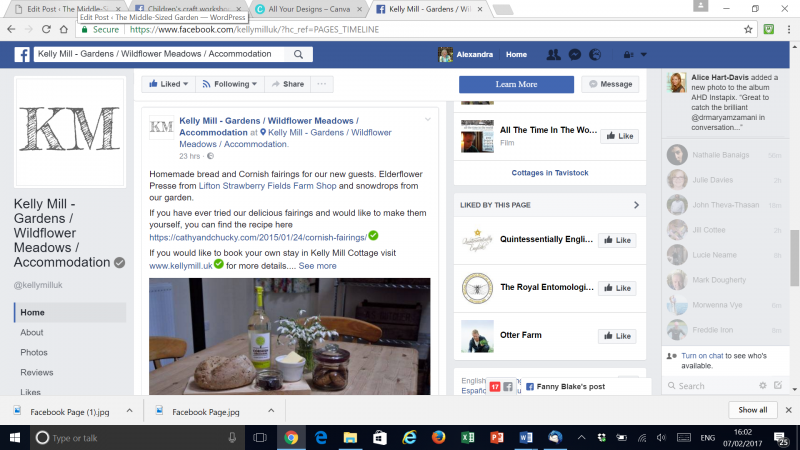 Since the £120 mistake, I haven’t paid anything to promote the Middlesized Garden Facebook Page. In just over a year, it has grown naturally to nearly 3,000 Likes. So I can assure you, from painful personal experience, that paying to promote your Page works. But if you’re happy with slow, free growth, that can work, too. However, I’m not even sure that having lots of ‘Likes’ on your Page is important. The algorithm (or paying) means that some Pages with not many Likes can reach as many people as others with lots of Likes. Do you need to pay every time you post? You don’t have to boost all your posts. Decide what’s important to you. Even fivers can add up horribly quickly. But, as a business, a blogger – or even a charity – you need to pay. Sometimes. One very helpful tip is only to promote successful posts. Post your latest news but see what response it gets before deciding whether to pay to boost it. You’ll get much better value for money. And you’ll also see what people are interested in. I reviewed it on the blog, and put the review on my Facebook Page. I was quite surprised to find that it was ‘organically’ one of my most popular posts. So other people are as interested as I am? I have now boosted it with £5. But I don’t always. You may be able to reallocate money spent elsewhere on promotion. Or you may decide it’s worth spending the cost of a couple of Starbucks coffees a week on promoting your posts or your Page. Sorry, I didn’t mean to shout. It’s just taken us bloggers a while to get our heads round this. There are ways of making the most of the free side of a Facebook Page. The first is to put really interesting stuff on it. Facebook wants people to see things they’re interested in on Facebook. If you write about cats doing funny things with garden widgets, Facebook will probably show lots of people that post. But if you write ‘New consignment of garden widgets in! Buy now!’ it will sink to the bottom of Facebook’s algorithm. Only your mother will see it. And, yes, your mother is on Facebook. Probably. On the other hand, if your Garden Widget Page is all about cats, that won’t do your Garden Widget blog or business much good. Think about what people are interested in. What are they looking for? What really matters to them? A Facebook Page should not be all about you (or your blog, business or charity). On the other hand, it should be partly about you. That’s why people clicked ‘Like’. It’s interesting to see behind the scenes. So don’t be too polite and non-commercial either. 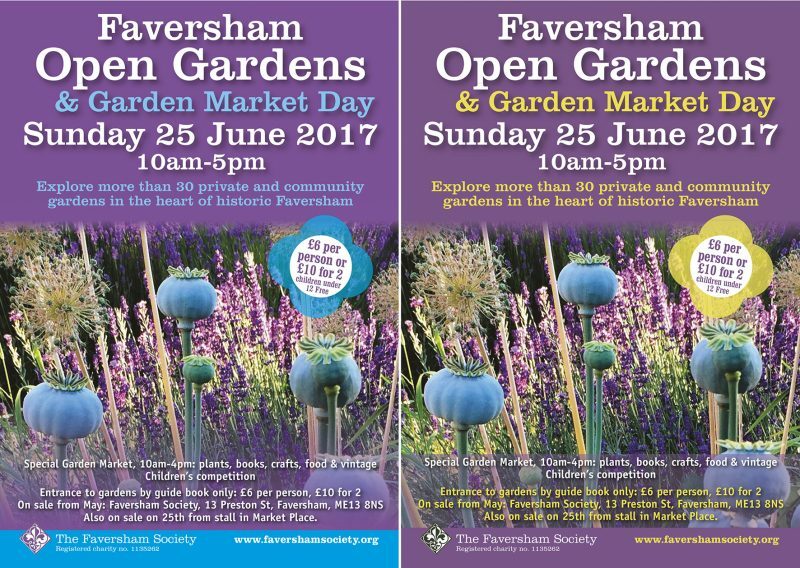 For example, we were recently trying to decide between two designs for a flyer for Faversham Open Gardens & Garden Market Day. We put both on the Page, and said we’d decided on the blue. Did people agree with us? We put these up on our Open Gardens Facebook page to see what people thought. This post reached over 1,500 people, got 17 likes and 14 shares. Without spending any money. It almost looks like an advertisement, yet it was one of our most popular posts. FYI the Page itself only has 399 Likes. Joining a Facebook Group is another reason why Facebook is important. You have to join a Facebook Group as an individual, however. Your Business Page can’t join a Group. You can post links to your blog, work etc, depending on the rules of the Group. Groups don’t have algorithms. Everything you post will be seen by everyone who looks at the Group. But don’t use a Facebook Group just as a dumping ground for your latest post or product. Facebook Groups are great places to find advice and support. For example, I’m trying to improve my photography at the moment. I’ve joined two photography Groups: A Year With My Camera and Makelight.You can ask questions and get feedback on your photographs. Most Facebook groups are closed, which means your posts can only be seen by other members of the group. Many (not Gardenbloggers) are the support and back-up for paid courses. Likes and shares are all very well. But it’s not the answer to why Facebook is important. Never lose sight of your real goal. Do you want more visitors to your garden? More readers for your blog? More people to buy your garden widgets? It’s only worth spending time and money on Facebook if it helps you achieve those goals. 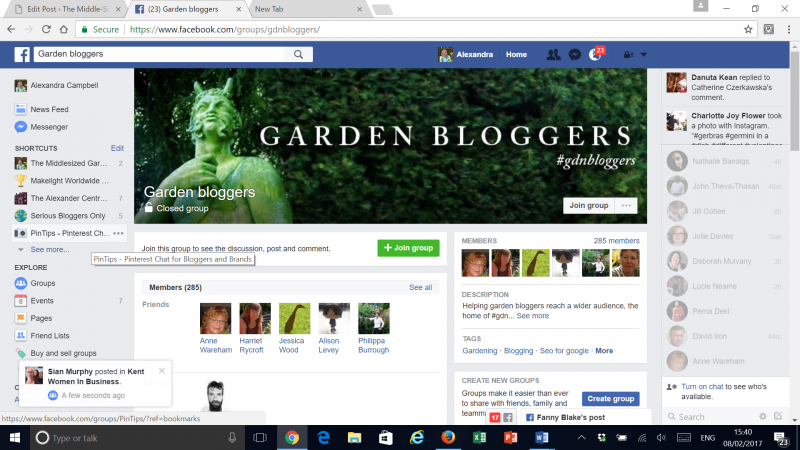 Facebook drives about 6,000 visits to the Middlesized Garden blog a year. That’s more than Twitter or Pinterest (around 5,000 visits each). But it’s still a small percentage of the total visits, compared to the 150,000 visits we get every year via search engines. More people come from Facebook than any other single source. And for the first year of the blog, social media accounted for 25% of total visits to the Middlesized Garden. This was equally divided between Facebook and Twitter. That’s why Facebook is important to me. So bear those figures in mind. Facebook is a time sink! One of the services I offer is a ‘blog clinic.’ This is a 6 hour package. For the first two hours, I check your blog out, look at your stats and see what your competition are doing. Then I make recommendations and discuss improvements in the next two hour session, usually by Skype or in person. The last two hours is for follow-up – whatever’s necessary. So far, I’ve always found that Facebook is a major driver of traffic to any blog, even when the blogger themselves doesn’t have a Facebook Page. It’s lovely that Facebook can drive traffic to your blog without your doing anything. But you’ll always get even more traffic if you become pro-active about it. If you want to publicise your blog, company or charity, the first step is to see what other people are doing. Look at lots of Facebook Pages. Decide what you like or don’t like. BBC Radio Kent Sunday Gardening Facebook Page. All of the following have a nice mix of garden information, inspiration and fun: BBC Radio Kent Sunday Gardening, Great Dixter, NGS London (and your local NGS), The English Garden and BBC Gardeners World. Look at your favourite companies, blogs and charities’ websites. Their Facebook Page link will be there (somewhere – often hidden away!). And do check Faversham Open Gardens & Garden Market Day and The Middlesized Garden’s Facebook Pages Thank you! If you’d like help with writing, blogging or finding your way through the minefield of communicating online today, contact me at alexandra@themiddlesizedgarden.co.uk. I do one-to-ones, in person or Skype. 13 comments on "Are you missing out? Why Facebook is important"
This was a really interesting post – especially once I had time to read it properly! I have a query over the linkage to your Personal Profile on Facebook though. Without thinking, as my WordPress template offers a link to Facebook, I just clicked to activate that so that it posts a link and short summary to my personal profile to alert friends that there is a new post. From what you’ve said, I’m guessing that’s against the ‘rules’? If you’re not selling anything or promoting your professional services – which you don’t seem to be – then it seems to me that the blog can be considered purely a personal diary, and therefore fine to put on your personal profile. I think it’s a bit of a grey area, and many bloggers do put their posts on their personal profiles. As far as I can see, there’s only a problem if payment is involved anywhere. You could always check the Facebook Help center just to make sure – us ‘civilians’ can’t always be quite sure how Facebook interprets the rules and we wouldn’t necessarily know if the rules had changed slightly. But if you ever do make money via your blog or use it to promote yourself professionally, a Facebook Page offers you more options than a personal profile. Hope that helps – sorry I can’t be more definitive, but only Facebook can be definite about what it allows and doesn’t allow. 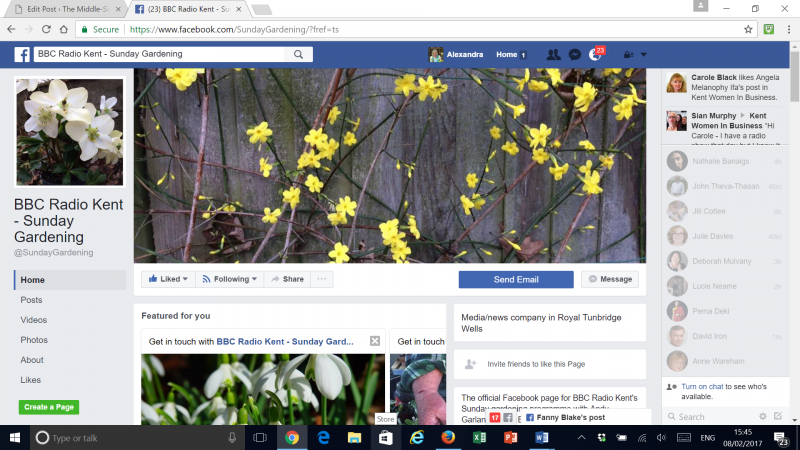 Alexandra, Thank you for your kind words about and link to, our BBC Radio Kent Sunday Gardening FB page. If everyone applies your earlier post about bideo and applies the results to their FB page too, there’ll be some fine gardening FB pages to spend even more time on! Thank you Alexandra. This is one of the best blog posts I’ve read in some time. Thank you also for the attention to comments. I’m going to set my page up now! A really interesting and useful blog post. I’ve discovered a few tips on how to utilise my Facebook page more effectively. I originally set my Facebook page up as a way of directing traffic to my blog post, but I don’t think it ever has…..we that’s what WordPress stats say. I’ve still got so much to learn. It is really interesting that what works for one blog doesn’t always work for another – I know quite a few people who get alot of traffic from Instagram, and I don’t get a single page view from it, though I love it and do it every day (and do all the things you’re supposed to do!). Might be worth checking Google Analytics as well as the WordPress stats just to check, though WordPress is pretty reliable. Firstly, you can keep your Facebook personal profile completely private, so that no-one can see it except you. There’s something called ‘Privacy Settings’ – probably best if a friend who is on FB sits down with you and shows you. 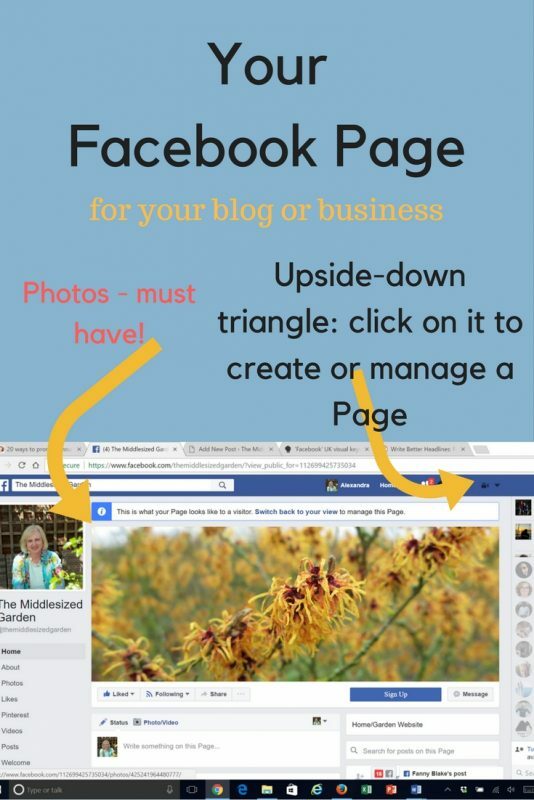 So you can manage a Facebook Page or Group for your garden club without getting involved in any of the friend stuff on FB. Secondly, the garden club should be a Facebook Group, rather than a Page, and you can make it a ‘Closed Group’ which means that once someone joins the club, they also join the Facebook Group. Then they can see when meetings are etc, but no-one else can (or you can make it an Open Group, so that everyone can see it, it’s up to you). The advantage of a Facebook Group is that there isn’t an ‘algorithm’. When you announce a meeting, everyone in the Group can see it, provided, of course, that they’ve logged onto Facebook. There’s no need to pay in a Facebook Group, and indeed, I don’t think there’s even an option to pay. Hope that helps. Thank you Alexandra! I don’t like Facebook – hated having to fill in such personal stuff (which if memory serves, I made up in the end) only have about twenty friends on it (I’d rather actually see people face to face) and I don’t want every ‘friend’ I know to know everything I do in my personal life but you have made me think. A fascinating and informative post. 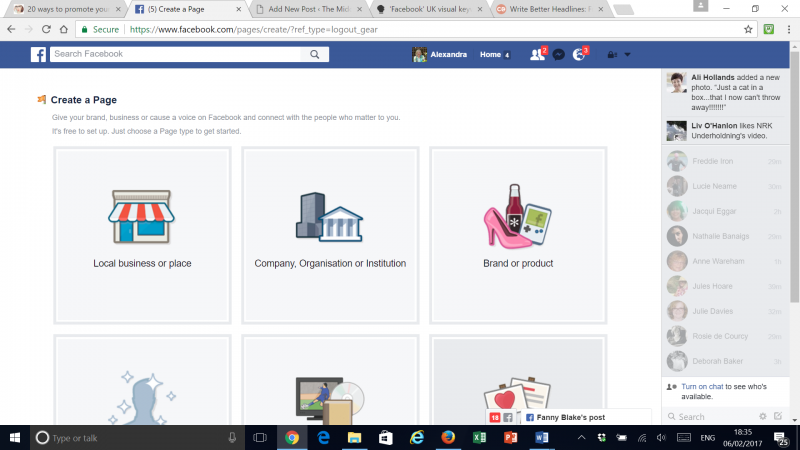 Is it possible to have a logged-out personal page and a logged-in facebook page? Go into the upside down triangle on top right corner, then click on ‘Settings’, then ‘Privacy’ and you can edit who sees what. You can make sure that only the 20 ‘friends’ see anything you post. Or you can even make your profile completely private so that no-one can see it except you. You can still manage a Facebook Page or Facebook Group from it. So you have a ‘hidden’ personal page and a ‘public’ Facebook Page, which is the equivalent of what you’re asking, I think. Hope that helps.